Nominations for this award category are only accepted from the six regional associations. 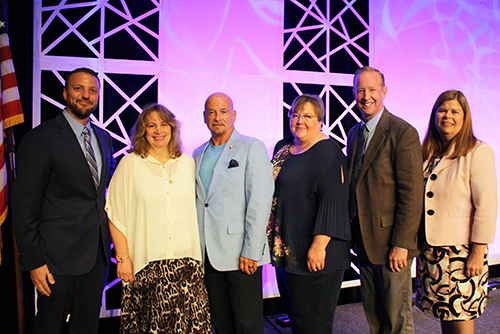 The NASFAA Regional Leadership Award is presented to individuals, who need not be financial aid administrators, who have made outstanding contributions to the financial aid profession at the regional and state levels over a sustained period of time. Leadership at the national level is not a criterion for this award. Current members of NASFAA's staff and NASFAA's Board of Directors, including non-voting members, are not eligible to receive this award. Have supported the goals and objectives of NASFAA. Odette has been actively involved in leadership and volunteer positions in both CAPFAA and EASFAA over many years. She cares deeply about the colleagues she serves with and for mentoring those new to the financial aid profession. Odette is always the first to raise her hand to volunteer when help is needed and the first to offer assistance to a colleague when needed. She is truly dedicated to students, her institution, and her colleagues and is a wonderful example of a financial aid professional. She has worked in financial aid for over 25 years and continues to devote her time to state and regional associations, most recently serving as EASFAA's Vice President. Odette has been recognized for her work by CAPFAA with the Jerome Cunningham Distinguished Service Award (2008) and the Lifetime Membership Award (2014) and by EASFAA with the Committee Recognition Award (2008 & 2011), Outstanding Volunteer Award (2011), Leadership Award (2013), and the Distinguished Service Award (2016). Val is a true regional champion for financial aid. She exemplifies everything this award stands for through her work ethic, engagement with students, and her sunny disposition. Throughout her life she has touched and changed the future of thousands of financial aid recipients. Beyond helping students, she also goes out of her way to mentor new members to the profession. Throughout MSFAA and MASFAA, many financial aid professionals think of her as a mentor and someone to whom they can rely on in times of need. Val is a powerful leader and has served as MSFAA President, MSFAA Treasurer, and MASFAA Treasurer. Art has made outstanding contributions to the financial aid profession at the regional and state levels over a sustained period of time and continues to do so. Some of his regional experiences include: RMASFAA Past President, RMASFAA President Elect, RMASFAA Representative and Chair of the NASFAA Thought Force on Aligning State, Regional & National Efforts. He is currently serving as Vice Chair for the RMASFAA Summer Institute Committee. He has a wide educational and professional background, including seven years teaching in Utah's public schools. Art loves working in financial aid and enjoys getting to know new people, and has served on a variety of UASFAA, RMASFAA, and NASFAA committees and has presented on numerous training topics. To say Nathan Basford exceeds the expectations of the FAFSAA and SASFAA membership would be an understatement. As a three-time state President, Nathan has made significant contributions. During his years of service, FASFAA instituted some wonderfully successful programs. During his time with FASFAA, he has served as President three times, Vice President of Training, Conference Chair, and numerous committees. Nathan as served as State President to SASFAA three times, served on NASFAA's Board of Directors and helped as a New Aid Officer Trainer. He has made a special effort to address issues of diversity within the state and regional organizations. Janell began her professional career as the Financial Aid Manager and then transition to the Assistant Director at Washburn University. She left Washburn University to become the Financial Aid Manager at Valencia Campus, University of New Mexico's branch campus in Los Lunas, New Mexico. In 2015 she became the Associate Director of Financial Aid at UNM's Health Sciences Center. She has chaired and participated in conference planning committee work – in both KASFAA and NMASFAA she was active in outreach functions. As the 2016 SWASFAA President and member of NASFAA's Board of Directors, Janell attained her goal to continue to make the organization relevant to the membership. She has presented on several topics ranging from leadership to loan repayment for her state, regional and national associations. Over her long and distinguished career, Kathy's worked served as a model of service and leadership. She began her career in higher education nearly 50 years ago when she worked in the Oregon Office of Senator Wayne Morse who, along with Congresswoman Edith Green, co-sponsored the Higher Education Act of 1965. Kathy then went on to the Oregon State Scholarship Commission, and later worked at Clackamas Community College and Chemeketa Community College, serving as Financial Aid Director at each institution. She served on many regional, state, and institutional committees, participated in a variety of state higher education groups, and testified numerous times before state legislators. The list of her contributions to WASFAA and OASFAA leadership and training are extensive – she held elected positions, chaired committees, and trained hundreds of financial aid administrators. She co-chaired and often served on the faculty of WASFAA's Sister Dale Brown Summer Institute and Jerry R. Sims Management & Leadership Institute, and for many years co-chaired and served on the faculty of OASFAA's FA 101/201. OASFAA honored her with its Unsung Hero Award in 2004, its Distinguished Service Award in 2015, and with Lifetime Membership in 2017. She also received Lifetime Membership in WASFAA in 2017. Kathy Campbell spent her career touching and improving the lives of thousands of students; and training, leading, and mentoring hundreds of financial aid administrators.